Ask fellow campers about "Shellmound Campground" and nearby attractions. This is a nice campground. It is by a lake and a public park. We were able to run and swim our dog early morning without a leash. The park is clean. There are some long-term rigs there. I wouldn't say it handles big rigs very well--at least not 40' motorhomes! We pulled in after dark...I would not recommend unless you are familiar with the park! Their website's directions are not correct so be cautious! We tried a couple sites before deciding on one. Pads are gravel and soft (maybe just because it is early spring?) Our front jack went in about 6 inches. The pull-thrus are half-circles so if someone is in "front" of you your ability to pull out of your site could be very tight. There is no sewer at the sites...only dump station. Overall, I think it would be a great park for smaller rigs. We camped at Shellmound Campground in a Motorhome. Love this park. This was our first time here since its 1.5hr out from our house. Very friendly staff also making sure everything was ok. Plenty of room for our kids to play safely and a huge bonus was the big playground area. Lots of area to fish which my husband loved. They had a big fire pit at every lot. Also a pole to hang a lantern if you needed one. Right off the interstate and close to a local Walmart if you forgot anything. Only thing that I personally don't like is they don't take reservations and do anything online. BUT WE WILL DEFINITELY COME BACK We camped at Shellmound Campground in a Fifth Wheel. 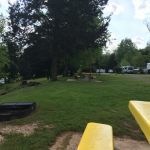 This is a very nice,clean campground located on Nickajack Lake/Tennessee River. Friendly management that were very accommodating! I have a small Casita TT, but the park could accommodate up to the largest Class A, I'm sure. Since I was only staying for the night and not even unhooking, the manager took me to a pull through site looking right at the lake. It was so pleasant, I hung around until almost noon the next morning! Electric and water hookups at sites, dump station on site. Perfect if traveling through because it is literally 2.5 miles off of I-24. They are open year round except for two weeks in January. They don't officially take reservations but if you know that you are coming in that no, you can call them and they will hold one for you. I will definitely stay there again overnight and hopefully for a few days sometime! We camped at Shellmound Campground in a Travel Trailer. At the same exit there is a Love's Truck Stop. Pros: Beautiful scenery, quiet (ok, trains across the lake rumbled some), on water, nice beach, excellent playground for the kids, clean and neat, LOTS of trash cans. Cons: WiFi only in a hotspot near office, no cable, Over the Air TV spotty, sites not all easily leveled. This is a TVA sponsored campground. We've stayed at a similar one last year and this one seems to have the same issue: they cater to seasonals or LONG term rentals. 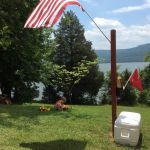 When you see a lot of campers with insulated water hoses in June with temps in the 90's, you get to understand that those who want to come for a weekend or even a week's stay may have a tough time getting in. There are NO reservations. Hmmm, so once in, guess you just stay. Yeah, they have weekly, monthly, and seasonal rates. IF you can get in it is a lovely place. We took a chance, and to be fair, when I called and talked to the manager, she said to call on our way up and she would confirm if a space was available. The campground itself if nice; the policy of favoring long term stays is disheartening. 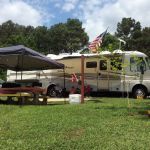 We camped at Shellmound Campground in a Motorhome. VERY close to Russell Cave and Lodge Factory Outlet. Also convenient to Chattanooga for all their great museums and attractions. 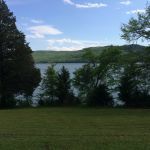 Clean, friendly folks with some long term "residents" with easy access from exit 158 of I 24, with a boat ramp, playground and a beautiful setting. The access is via a TVA road with the entrance on the left of Shellmound Road. Once in a while there is a bit of noise from a railroad across the lake and a boat. Very peaceful. We camped at Shellmound Campground in a Motorhome. Are you affiliated with Shellmound Campground ?